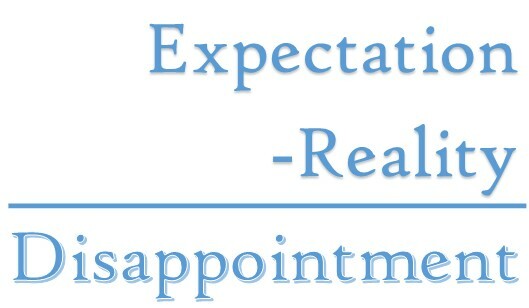 At a high school reunion almost ten years ago, one of my brilliant classmates said, “Disappointment is the difference between our expectations and reality.” Obviously, the idea has stuck with me, and I’ve been reminded of it quite a bit lately. In workshops, I ask if anyone has had a month that went according to plan. The answer is always laughter and some groaning. Then I ask who has had a week in the last few months that went smoothly and without surprises. I get some head shakes and mumbles. Then I ask if anyone has had one day in the last six months that went exactly as they planned it. Every now and then I get a hand in the air, but it’s very rare. Even though our days rarely go without a glitch, we expect them to go perfectly ̶ no forgotten items, no car trouble, full milk cartons, and no last-minute requirements or changes. It’s an unrealistic expectation, and we are constantly disappointed and annoyed. We end up tossing a lot of emotional pennies[LINK TO BLOG] at events that don’t deserve that much attention. It’s more useful and productive to expect things to go wrong. I don’t mean we should adopt an Eeyore attitude of doom and gloom; it’s not healthy to expect everything to go wrong. We are looking for a healthy balance. If we spill something on a shirt, we can take a breath and recognize it as today’s glitch – not a super annoying personal attack. Accidents and mistakes are okay and normal. Keeping things in perspective can help in most situations. For example, I am currently moving into a condo. I never planned to live in a condo at this stage in my life. Reality is less than my lifelong expectations, and I’m mad about it. I am also disappointed. My resistance is causing me to use a lot more emotional pennies than is necessary. I’ve been working to adjust my expectations. There is nothing wrong with my condo. It’s updated and cozy. It’s all the space that I need. By accepting my situation and lowering my expectations, I create more contentment and peace. Our goal is to be wise enough to accept what we cannot change right now. I don’t plan to live in my little condo forever, and I am taking actions to change my situation. However, it’s the best place for me now. Accepting where I am now saves a lot of emotional energy that I can use to change those things that I can. There is a need to maintain a balance of our expectations. I am not suggesting that we lower our expectations so far down that we are never disappointed because that would also diminish our drive to set stretch goals and challenge ourselves. When leading others, wisdom and realistic expectations are essential. I’ve watched a plant manager have a meltdown and yell at an employee because a piece of machinery broke down. First, it wasn’t the employee’s fault. Second, machines break sometimes – even with proper maintenance. Third, being outraged at a glitch and the people dealing with it damages the relationships. Great leaders create positive relationships. It’s way more productive to expect bad things to happen now and again. It’s better to think, “Well, here’s today’s mess. How can we clean it up?” Spend the emotional pennies on solving the problem, not being outraged that it’s messing with your plans and not meeting your expectation of a perfect day. Serenity, courage, and wisdom can carry us a long way towards having a good day. Maybe not a perfect day, but a good one. It’s all in how we manage our expectations. Well said!! Thanks for the wonderful reminders! I had a day that was going straight down the tubes yesterday as soon as I set foot outside. After the 5th mishap, I had to sit back, laugh, and roll with the punches as it was just going to be that kind of day! Perfect timing to receive your message today.